Dental emergencies tend to happen suddenly, and at the most inconvenient times to boot. If you or a family member is suffering from significant dental pain or damage, having to wait for relief can be an enormous burden. That’s why our team strives to provide emergency attention as soon as we possibly can. If you’re a patient of record, please contact us even if the practice is currently closed. We can also offer you valuable information and guidance over the phone for how to best manage your condition until we’re able to see you in person. 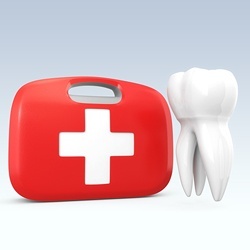 Can Dental Emergencies be Avoided? Not always, because accidents do happen. However, one simple thing you can do to protect all of the smiles in your family is insist that an athletic sportsguard be worn during play and practice. We can create a custom-fitted sportsguard that fits comfortably in your mouth to protect teeth, gums, cheeks and lips while you concentrate on your game. So while the staff at Bell Dental is here to help when you have a dental emergency, we’d really much rather not see you because trouble was averted with a sportsguard! Are you unsure if you’re actually experiencing an emergency? Please don’t play the “wait and see” game. We’d much rather see you in the office and determine that you’re not having an emergency than miss something that is truly serious. If you have heavy, continuous oral bleeding or a possibly broken jaw, please go to your nearest emergency room for assistance. Our team can then provide patients from Louisville, KY and surrounding areas with any needed restorative care after they’ve healed from the initial trauma. What Should I Do When There is a Dental Emergency? At first, immediate treatment for a dental emergency is not different from a medical emergency. If there is bleeding, then that needs to be stopped. Use a clean cloth or a gauze pad to apply gentle but firm pressure to the site. Very often, biting down on the cloth will provide just the right amount of pressure without injuring delicate tissue. If bleeding does not slow or stop within 10 minutes, then you need to head to the nearest hospital emergency room. After stopping the bleeding, treatment depends on the type of emergency at hand. If a tooth has been knocked out, touch only the crown and not the root of the tooth. Rinse in cold water and then try to place the tooth back in its socket as you drive to our office. Alternatively, the tooth can be transported in a sealed container filled with milk. For a dislodged tooth, never force the tooth back into position. Gentle pressure is okay, but nothing more. A lost filling or crown may be temporarily held in place with denture cream, petroleum jelly or dental cement. A painful toothache may indicate tooth infection. Call the office right away to schedule a same-day appointment with the emergency dentist in Louisville. Root canal therapy may be required to remove the infection and preserve the tooth. If you see something stuck between two teeth, try using floss to remove it. Never insert anything sharp in the mouth! If floss doesn’t work, contact Bell Dental to schedule a visit. If you have a tooth causing you pain from decay or an infection, your emergency dentist can give you the relief you need with a root canal. Now, root canals are less painful, so you have nothing to fear. After extracting the pulp, we fit you with a custom-made crown. Your tooth’s health, function, and appearance are restored to save your smile and stop your pain.